3. When you reach the checkout click ‘Gift it to a friend’ – here you will enter your friends postal address and you can also enter a personalised message you would like to arrive with their muesli. Note: each order will only have one voucher code, to buy multiple separate voucher codes please process as separate transactions. 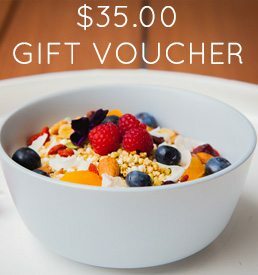 Craft your own unique muesli mix for your company, we will package this up beautifully with your branding and a special message, then deliver it directly to your clients. Prices per 500g bag of custom muesli start at $16.00. Delivery direct to the receiver is $5.45 Nationwide.